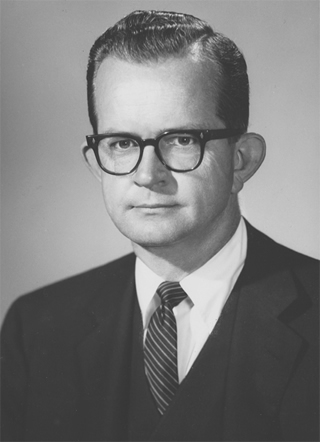 Theodore Osmundson, circa early 1960s. Osmundson's niche became the roof garden, which included this design for Kaiser Resources Ltd. of Vancouver, B.C., late 1970s. Like his fellow veterans of the Church office, Ted Osmundson (1921-2009) began his practice right after World War II designing small gardens alongside small houses. Architect Roger Lee, famous for small, stylish houses, and Osmundson collaborated on many projects, including an outdoor-indoor scheme for a young family who owned a narrow, urban lot. The house was redwood post and beam. Osmundson provided trellises, play spaces for kids and for adults, and outdoor living and dining areas. 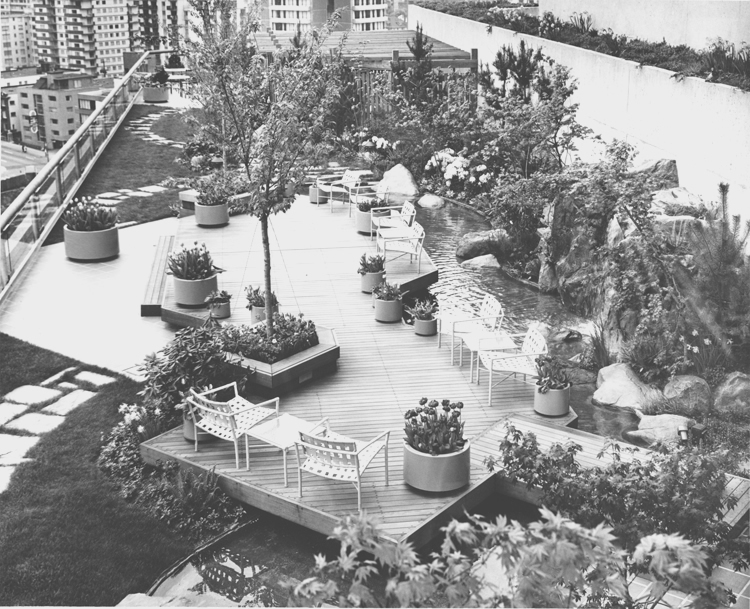 By the early 1960s, though, Osmundson, who headed a series of small firms, had created a niche for himself that provided a broader view of landscaping—roof gardens. The roof garden he designed for the Kaiser Center in Oakland, with its curved waterways, low bridges, tranquil lawns and mini-forests, immediately won the hearts of workers in the soaring, curved, aluminum-clad building, and the public as well. The garden remains a Bay Area classic, open to all. Although it was far from the first roof garden (Osmundson later wrote a book on roof gardens that delves into penthouse gardens from the 1920s and Rockefeller Center from the 1930s), the Kaiser garden was said to be the largest in the world at completion, and inspired many other designers. Though Osmundson designed parks, woodland trails and greenbelts, and other gardens throughout his career, roof gardens remained a mainstay. Osmundson not only mastered the engineering and horticultural challenges of creating natural areas on unnatural terrain, he taught others how to do the same.